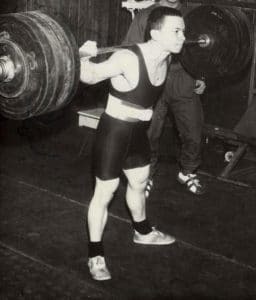 replicate these systems and take something from them and developed his own system of training in Derevyanko I. G., is now one of the best in powerlifting, for which I am very grateful to him, he taught me a lot. We have never crossed the load when needed to relax after a heavy load, we did and had a rest, until the body is again not adequately started to react to the loads. In my training plan at the primary level consisted of the classic exercises of powerlifting: squat, bench press and deadlift. Also there was a small amount of auxiliary exercises for those muscle groups that were involved in this training day. We’ve always used periods of training, preparation, precompetitive and competitive, all this combined with the group exercises the basic and preparatory. In the beginning of my sports career, my training program included exercises for muscle pump and they had 4-5 exercises on each muscle group, allowing time to create a good muscular corset. In the future, the load in competitive drills increased and we have abandoned a large number of exercises for each muscle group. Pavlov Konstantin world championship 2004 South Africa, before the bench press. 2. The layout of dumbbells lying on a bench – 5+5х12х1, 10+10х10х1, 15х15х6х3, 5+5х12х1. As it may seem, the load is not large, but it is enough for me to progress. Then of course there were so many different experiments, including performing basic exercises on the scheme 8 reps x8 set, 7×7, 6×6, 5×5, 3×3, 2×2, adding each week at 10 pounds each movement of basic exercises that have led to increased result. 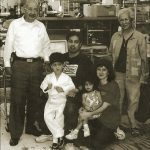 My first competition took place on 28 August 1991 and it was a competition club where I started, so that’s I showed then: squat 125 kg, bench press – 85 kg., deadlift – 120 kg. and the amount of triathlon 330 kg and my own weight 47 kilos 500 grams. Further, the training program was compiled in the percentage of maximum weight lifted in each of the competitive exercises, the squat, bench press and deadlift. My best competition performance: squat 275 kg at a bodyweight of 59 kg , bench press 200 pounds, deadlift of 227.5 kilograms with weight of 56 kg and the sum of 700 pounds at a bodyweight of 59 kg. Pavlov Konstantin world championship 2004 South Africa. 6. Press 3 sets to maximum. 5. Press 3 sets to maximum. In the preparatory period. all competitive exercises are performed without the use of special gear, only a belt and bandages. Well that’s it, to be continued! 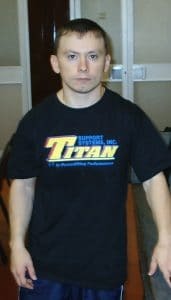 Again thank the company “Titansupport” and President Alaniz Pete, thank you Pete!!! 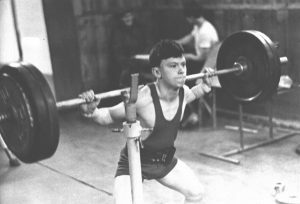 HISTORY OF POWERLIFTING, WEIGHTLIFTING, AND STRENGTH TRAINING NUMBER 104: POWERLIFTING AS A MEANS OR AS A SPORT? Part Three Мой тренинг или как я готовился к соревнованиям.